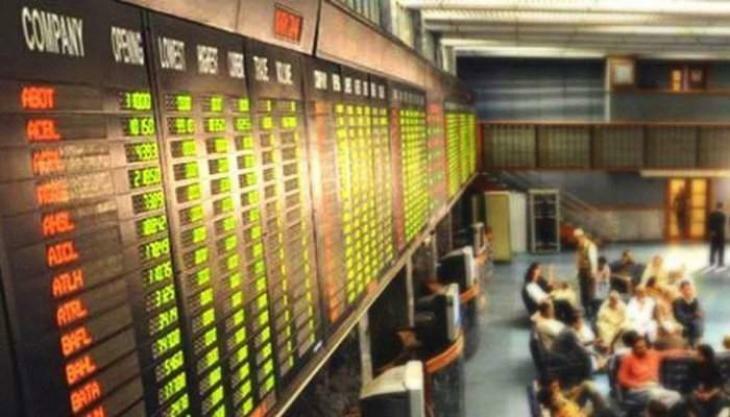 ISLAMABAD, (UrduPoint / Pakistan Point News - 16th Apr, 2019 ) :The pakistan stock exchange (psx) on Tuesday witness bearish trend as KSE 100 index lost 122.13 points (0.33 percent) to close at 37,381.95 points. A total of 95,324,120 shares were traded, whereas the value of shares traded during the day stood at Rs 4.2 billion. Out of 338 companies, share prices of 139 companies increase while that of 176 companies registered decrease whereas 23 companies remained stable in today's trading. UNITYR1 was the volume leader with 16,335,500 shares, and its per share price decreased by Rs 0.75 to close at Rs 2.29 per share. KEL remained the runner up with 13,353,000 shares traded during the day and its price also decreased by Rs 0.09 per share to close at Rs 5.1 followed by PAEL, trading volume of which was recorded at 13,128,500 shares, and its price per share increased by Rs 0.11 and closed at Rs 22.98.